Tony Abbott has arrived in the drought affected regions of Western New South Wales and Queensland to discuss a potential government aid package with struggling regional farmers. By all accounts, these regions have faced a devastating drought over the last two years, with some areas not receiving any significant rainfall over that period. While farmers do have a drought contingency plan for up to a year without rain, the two year drought has left many struggling to cope, falling deeper into debt just to keep their stock alive and put food on their table. With insufficient grain to feed their cattle, many farmers have been forced to put animals down. 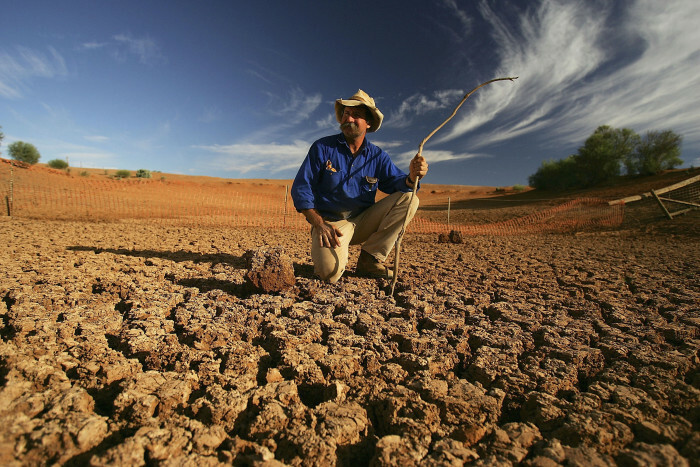 2013 was the hottest and driest year in Australia’s history, a symptom of our warming climate wreaking havoc on our climate systems. More intense and prolonged droughts is one of the most visible signs of climate change we’ve seen recently, with extreme flood events the other side of the coin. But as with the freak September bush fires seen in NSW in 2013, Tony Abbott has completely dismissed any link between the drought and climate change. With these words, he also placed the burden on farmers to deal with the impact of climate change themselves which is extremely insensitive in a time of great need. True to form, he also managed to throw in a blow to the carbon tax, indicating that abolishing it will help drought stricken farmers cope financially. The government continues to ignore the big picture in favour of the three year election cycle. While we must help our farmers cope with the increasing adverse impacts of extreme weather, climate action is crucial to ensure the survival of their livelihoods for generations to come.